Sports and Culture, a closing cultural discussion that showcased Qatar’s efforts in bringing communities together through sports, in parallel with the spectacular local preparations to host the 2022 FIFA World Cup. The close harmony between sports and culture was the most striking unique aspect that this entire dialogue has brought to the audience. 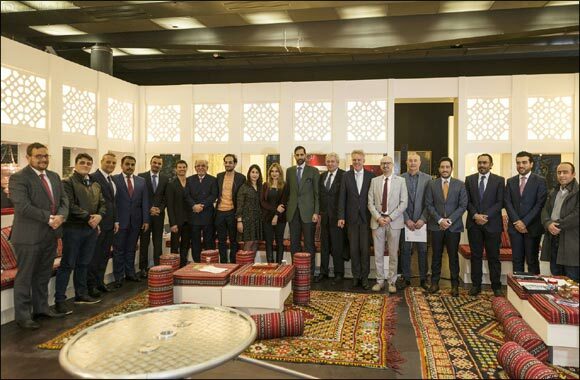 Doha, Qatar, March 16, 2019: Following a two-month unique stay at the Institut du monde arabe (IMA) in Paris, “The Majlis – Cultures in Dialogue”, a traveling cross-cultural exhibition organised at the initiative of the Sheikh Faisal bin Qassim Al-Thani Museum, hosted a breathtaking closing cultural ceremony on March 10th, 2019, in presence of leading dignitaries from France and Qatar, waving off to a new European destination as part of its global inimitable tour. The exhibition that features a collection of a unique assembly of artefacts reflecting the interaction of civilizations in the past while encouraging dialogue in the present, was the ideal spot for interesting open cultural discussions, having them held during the past two months at the heart of the majlis, the main hub of the exhibition. Grabbing the French audience’s attention to key topics such as “The Power of Language in Shaping Culture' and 'Evolving Art to Identities' throughout its cultural discussions at IMA – where attendees discussed the advancement and preservation of culture through language and art – the organizers had chosen to end its exceptional journey in Paris by discussing “Sports as a Driver of Cultural Change” - one of the most pressing topics in Qatar today and in which all Qataris and expats are equally interested, given the spectacular local preparations to host the 2022 FIFA World Cup. The cultural dialogue was a great feat. It brought forth the synergies and links between sports and culture and emphasized on how sports can help in engaging cultural interaction. The agenda was remarkably projected by renowned speakers including Mr. Phillipe Vinogradoff, French Ambassador for Sports, Dr. Jean-François Robin, a Specialist in Work Psychology and Sports Didactics, Mr. Khalid Jassem, Qatari TV presenter and writer on Al Kass TV Sports Channels, Mr. Xavier Bouyer, international well renowned performer and artist, and Mr. Nasser Al Hinzab, legal counsel of Qatar to UNESCO. The exciting discussion focused on Qatar’s pioneering role in this regard, starting by designating the second Tuesday of February of each year as the country’s National Sports Day – a date that is aimed to promote sports and educate the local population on ways to reduce health risks associated with inactive lifestyles, while bringing communities closer together through sport, based on the sporting principles of team building, inclusion, unity, participation, fitness and health. Mr. Khalid Jassem, highlighted the importance of having that day as part of the Qatari calendar while emphasizing on the government’s efforts that are successfully putting Qatar on the global sports map. “Whether through Aspetar that assists athletes to achieve their maximum performance and full potential or Aspire Zone that aims to enhance sports performance and act as the reference in sports excellence worldwide by 2020, Qatar went far in promoting sports culture and still has big ambitions to achieve”. He added: “We are proud to be the country host of global players looking for the best pitches for training or the best equipment for medical supervision such as Neymar Jr, and we look forward to bringing thousands of people from around the globe by 2022 under one roof, not to only celebrate the awaited world football tournament but to also revive the values of equality and diversity through sports from the heart of the Arab region”. The closing cultural discussion saw a magnificent performance by Mr. Xavier Bouyer. A choreography that showcased the power of physical balance in delivering the meanings of impartiality and peace. On the exhibition’s concept, Mr. Phillipe Vinogradoff, French Ambassador for Sports, commented: “Visiting The Majlis – Cultures in Dialogues is a surreal experience for art enthusiasts. The traveling exhibition has not only been able to achieve the objective of bringing people closer through the innovative pieces of art but has also broken the glass ceiling of exchanging cultural ties. I felt elated to be part of this unique concoction of preserving cultural heritage. I would like to congratulate the organizers to have achieved such a tremendous feat in making people aware about the vastness of Arab culture and delivering the importance of museums in preserving art and culture”. “We feel proud of the interaction that our cultural discussions were able to create at Institut du monde arabe. Being at this important cultural destination complements our role in bringing cultures closer together. The closing ceremony discussing culture and sports was indeed an achievement by itself following the overwhelming response we have received from all speakers and attendees. This success lays a greater responsibility on our shoulders as we are eager to continue with our cultural global mission of bringing people from different backgrounds together.'. Post a very enriching and influential voyage into the cultural hubs from Grand Master's Palace in Valetta - Malta, the UNESCO Headquarters in and Institut du monde arabe in Paris, ‘The Majlis – Cultures in Dialogues’ has set its course to visit new European countries, including Austria, Germany, Spain, Turkey, and the UK. The tour will also include the United States by 2021. The exhibition has been organised in collaboration with the UNESCO Doha Office and Institut du monde arabe, as well as under the Platinum sponsorship of Qatar Shell, Silver sponsorship of Refalo & Zammit Pace Advocates, and local sponsorships of QNB, Katara Hospitality, and Handson.